During query execution, the progress is shown in the bottom right corner of the interface. 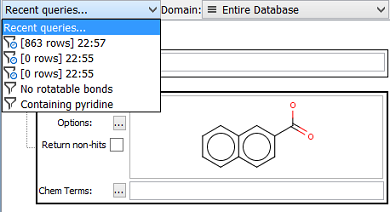 Before IJC 16.3.7.0 Clear Query cleared the query definitions, but the Structure Editor (Marvin, ChemDraw) "remembered" the last drawn molecule for convenience of drawing similar molecule in the next query definition. This behaviour was changed for simplicity and now Clear Query not only clears the query definitions, but also the Structure Editor. A slow running query can be cancelled . A progress dialog will appear if the query takes a significant amount of time to execute and the query execution can be stopped by clicking on the ' ' button. The ability to stop a query is dependent on the type of query and the stage of execution it has got to - stopping will not always be successful. See the Performance tips tips and tricks page for suggestions about how to speed up slow searches. 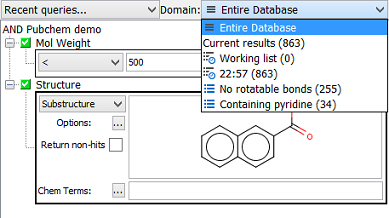 Previous queries can be restored to the query panel using the Recent queries... drop down menu. This sets the query parameters and allows you to re-execute the query or to edit the query before executing it.